Main House Living Room with four couches and fireplace! 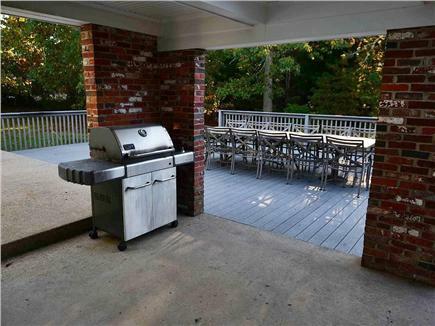 Huge Deck with Trex and Weber Grill! Garage Ping-Pong table tournament area! 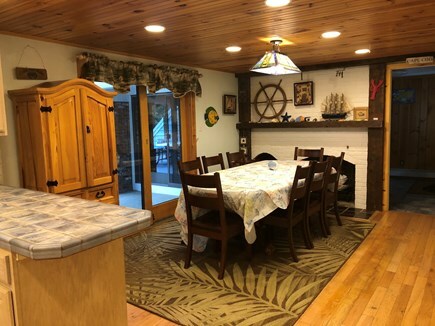 Huge vacation rental family home with high speed broadband wireless internet, Central air conditioning throughout main house and in-law apartment and cable TV. 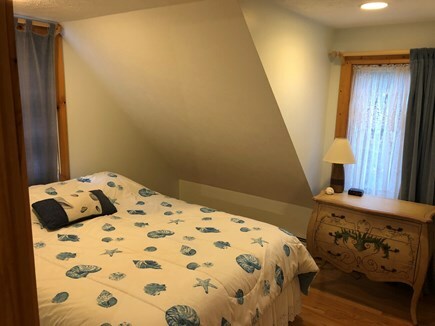 This beautiful, roomy, newly completely remodeled home is on the bay side of Eastham, near the famous and historic First Encounter Beach, National Seashore Museum, and Nauset Lighthouse! Walk out the door one block to Kingsbury Beach on the bay, and across the street to the crystal clear freshwater pond at Wiley Park - complete with fishing, dock, playground and public facilities! WC ramp to the water. Huge enclosed playground for kids! Beautiful new outdoor shower and new deck! 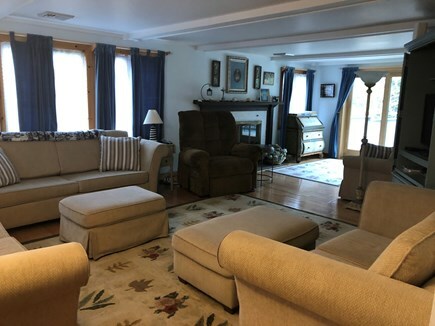 Main House: 5 bedrooms, 2 bathrooms, guest room and very roomy with lots of living room and a lower level game room play room area (pool table and ping pong table). Large mud room for gear and three huge sliding glass doors to huge outside deck! Plenty of outdoor patio furniture to gather with the families and kids. Hardwood floors on main level with brand new carpet upstairs. Sky blue tile in lower level bedroom and game room area with a competition pool table and a ping-pong table for family fun. Home Highlights: Central air conditioning, 2 fireplaces, broadband wireless internet, full gourmet kitchen with Wolf stainless gas stove and grill cooktop, Bosch dishwasher, huge refrigerator, gourmet cooking utensils, lobster pots, cooking pans provided, Maytag washer and dryer, Weber gas grill (BBQ) is on the deck. Absolutely no smoking and no pets allowed on premises at any time. This house is smoke free and pet free! Immaculately clean! We have pride of ownership and lots of repeat customers! **In-law apartment is available to rent if you wish to expand your space! Location is above the garage and attached to the main home includes 2 bedrooms, 1 full bathroom, full, brand new kitchen. 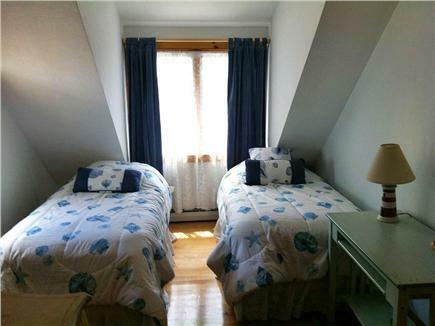 Sleeps 8 in 1 queen bed, 2 twins, 2 trundle bed twins and 1 queen sleeper couch. 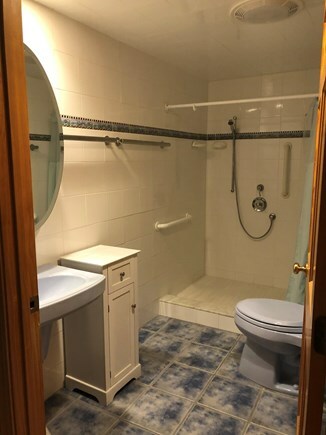 Nice option for privacy with other main home rental. **In-law apartment rented only in conjunction with main house - not rented separately. Add the In-Law apartment with the main house rental to expand your space and have more areas for visiting families and kids! In-law apt. is available only with the main house rental - otherwise locked off. 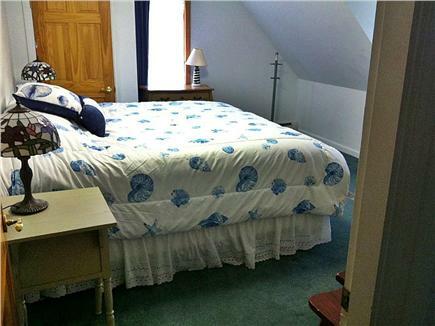 Main floor: 1 bedroom with king bed and full separate bathroom with step in shower. Easy access for everyone. Upstairs: three huge bedrooms with bed layout in each room. 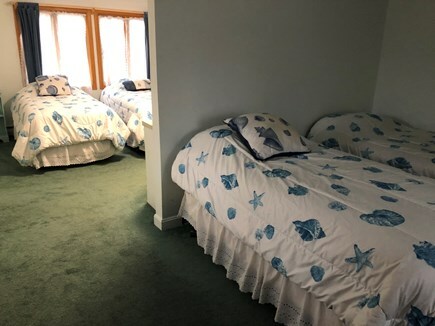 #1 - one king; #2 - two twins; #3 - four twins per room with full bathroom. Downstairs area:1 bedroom with two twin beds with full recreation room with and pool table and ping pong table! Living room: two queen-size sofas with sofa beds if needed. Two fireplaces in living room and kitchen, not operational-decorative only. Living area: desk, cable TV, VCR, stereo, and CD player. Internet access: Use your local phone access number for Eastham, MA. 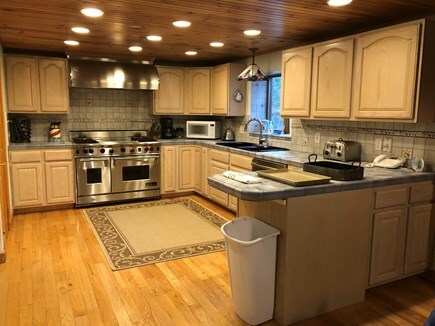 Gourmet kitchen: Wolf stainless gas stove with grill cooktop, Bosch dishwasher, huge GE refrigerator, gourmet cooking utensils, lobster pots, cooking pans provided, Maytag washer and dryer. Deck: Huge TREX 20-foot by x 16-foot deck off living room and patio, lots of outdoor eating areas, and patio furniture to go with Weber gas grill! Outdoor shower is convenient when returning to the home from ocean or lake! Large outside lawn area with a sand area for kids. Mud room: lots of storage area for large beach items. Garage: Not included in rental and locked off. Downstairs area is a huge recreation area with ping pong table and pool table for family fun! Garage area to park bikes or an extra gathering area for arts and crafts on rainy days or just an extra area to have fun! 50% total price due with lease, balance due 60 days prior to arrival. Please contact us early, we sell out each year! During Summer season, only 7 night stays available from Friday to Friday, other season dates we are flexible. Security deposit is refunded immediately within the week with no damage! This home is well liked by families that rent year after year as it is totally convenient to shopping (Orleans), churches, and leisurely walking to the beach out the back door or across the street is the lake. Quiet neighborhood, home is on the national bike trail so bring the family bikes! Absolutely no smoking and no pets allowed on premises at any time. This house is smoke free and pet free! Immaculately clean!, We have pride of ownership and lots of repeat customers! Additional availability info: Please call for dates not listed-we will consider weekend rentals off season!. 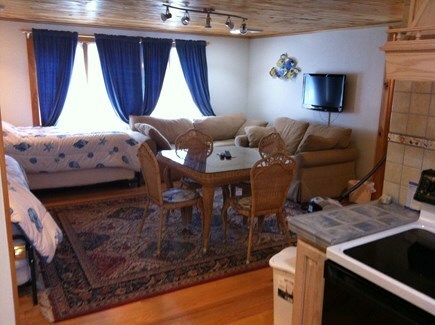 This is a Friday to Friday vacation rental. Long-Term Rental (1 month or more): Our home is available from December 1 yearly until May 1. The rent is $2,800 per month for main house plus utilities. 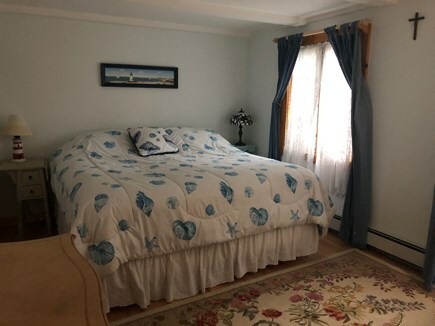 Excellent location and proximity to bayside ocean and freshwater pond make it a lovely setting for walking to the bay beach or freshwater pond. Additional pricing info: Add In-Law Apt: $1,500 per week June 26, July, August, All holidays. State and local taxes of 12.45% will apply. The house was perfect! We are a large family and there was room for everyone! I don't know which the grandkids enjoyed more - the beach or pool and ping pong! Marie was so caring and concerned that we have a great time. I can't think of anything I would change! We hope to be back next year! For our yearly family reunion, this place is absolutely perfect. A 5 minute walk down a path to the beach, a 5 minute walk across the road to the pond, a 5 minute bike ride to the bike trail, a 10 minute car ride to shopping or restaurants or national seashore, or if you really want to explore the Cape, you're pretty much right at the epicenter of whatever you might care to see. Our clan has children between 5 and 20, parents in their 40s and 50s, and matriarch and patriarch, and there is always something for everyone. There is a wheel-chair ramp and bedroom on the ground floor, a game room and bedroom in the basement, bedrooms upstairs, an absolutely fabulous kitchen and deck off the back with tables and space for a crowd. Our large family has been renting this property every summer for 5+ years. The location is perfect for us - short walk to a playground/pond beach one direction and an easy walk to the bay beach the other direction (beautiful sunsets too). The bike trail is about a mile away- (quick ride to Arnolds). We rent the home and the apartment which works well for a bit of privacy for our extended family. We dine nightly on the large deck, and the yard is large enough for our annual "Family Olympics"..
We have found the owner to be very responsive to our queries and when needed the handyman was prompt to fix the problem. 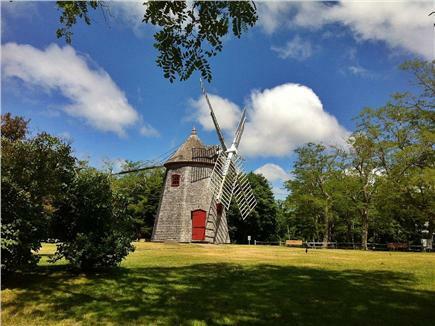 About the owner: We are Cape Cod lovers that enjoy the ocean and are happy to share our home with families and kids! Many of our families have rented from us over 16 years and counting! Expand the family with the convenient in-law apartment rented ONLY to the main house families. 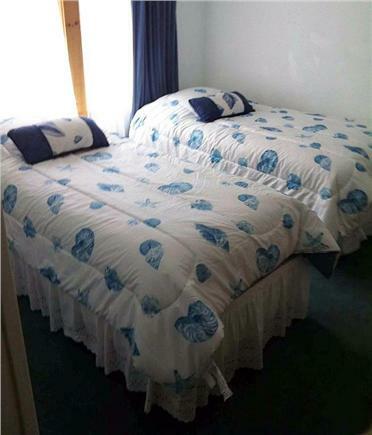 Great for separate lovely accommodation but on the same property! Great for giving the family extra room! We have a huge recreation room in the basement and a new large bonus room in the garage area! Families that rent from us year after year enjoy the cleanliness, closeness to the bay beach and Wiley Park freshwater pond lake and park across the street! Join us! 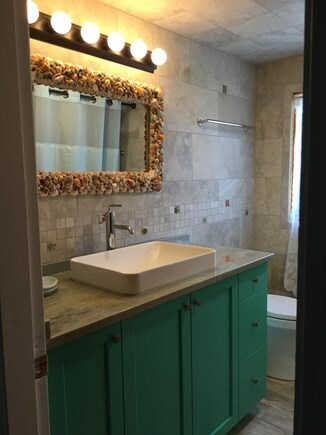 Excellent location for walking to Bayside Beach to enjoy only 1 block away or walk across the street to a stunning clean freshwater lake at Wiley Park, with full docks for fishing, swimming, kyaking, canoeing and an enclosed playground for young children with lovely bathroom facilities. Home is on the bay side of Eastham, near the famous historic First Encounter Beach, National Seashore Museum and Nausset Lighthouse! Walk a short block to Kingsbury Beach and enjoy the day with super sunrises and sunsets. When the tide is out, then walk across the street of our home to Great Pond at Wiley Park and enjoy the freshwater pond swimming, docks and great family atmosphere. A full children's playground and super clean facilities are there and hiking trails in the pines. Beautiful sandy beach is to be found at Great Pond. This is a very unique property with access to Bay Beach Ocean and freshwater Pond! Other Activities: Kayaking, boating, shelling, racquetball, basketball court, horseshoes and other beach activities of your choice!